Searching for a way to enhance the value, appearance, and functionality of your home? Then count on our full-service company for quality hardwood flooring. We are proud to offer a vast assortment of hardwood options and professional-grade installation services for your property. At our company, our professionals pride ourselves on the variety of stunning hardwood collections we offer our customers. Our inventory includes a wide selection of finishes, species, and materials that suit your every need. Whether you prefer a light grain or a darker stain, our showroom's low hardwood floor prices make it easy to get exactly what you want. For many property owners, hardwood is synonymous with timelessness. This is for good reason. Wood flooring has long been the go-to material for homeowners seeking to impart a classic look and feel to their homes. The appearance of this flooring is unmistakable, and is sure to leave a lasting impression on guests. The earthy tones and natural grain patterns give solid and engineered hardwood flooring a unique and warming presence. At the same time, this natural look comes complete with a smooth feeling underfoot. The telltale acoustics of stepping on hardwood sets a distinct environment that cannot be matched. Truly, wood sets a unique setting for your home. So whether you are planning to revitalize your common areas or add a little class to your bedrooms, hardwood is always a sound investment. Nothing shows elegance and sophistication quite like solid hardwood flooring. The tongue-and-groove milling that complements this stunning, long-lasting floor material provides unsurpassed durability and strength. For your ultimate convenience, it can also be sanded several times for simple maintenance. Known for its ability to enhance rooms with warmth and beauty, solid hardwood floors have become a popular choice among homeowners. Not only will you be happy with your new floors, but you will also take pride in the increased value of your home. From elegant natural tones to cooler colors, this type of flooring enhances any design theme. When you pick our company for your flooring needs, you are getting wood floors from leading manufacturers. There’s no need to limit your interior design options when you choose wood flooring. Thanks to contemporary manufacturing methods, this material has enjoyed an added layer of resiliency. Areas prone to moisture or higher humidity can benefit from engineered hardwood flooring. Constructed to incorporate both layers of hardwood and a resilient core layer, this material is able to resist water and the warping that comes with it. As such, engineered hardwood is a popular addition to basements. Whether you are seeking to spearhead your next project with solid or engineered hardwood, we have you covered. Our showroom proudly features well-known brands and manufacturers, allowing you to view and order dependable products directly from our store. We have many brilliant samples on display, so you are welcome to design and coordinate your next project at your leisure. Your options are limited only by your imagination. Choose from a wide variety of species, finishes, and stains. Our sales representatives are here to listen to your design goals and make informed recommendations, making it even easier to attain the aesthetic you are planning. Of course, we also have a wealth of unfinished hardwood flooring, so you have additional control over the direction of your project. Whether you wish for a “reflective” surface or the rustic sensibilities of hand-scraped hardwood, we have eh products to make your next project a success. 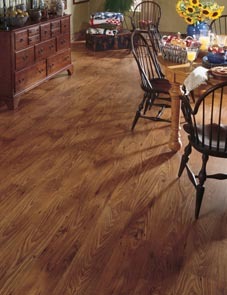 Achieve the stunning look of hardwood floors and ensure your investment with our certified and experienced installers. When you call our company, we send out a skilled team of professionals to make your hardwood flooring installation as efficient and convenient as possible. Our associates have the experience and skill needed to improve the look of every room in your home through proper services with meticulous attention to detail. From carpeting to luxury vinyl tile, we can install your favorite flooring in any room. Feel confident knowing that you have an experienced hardwood flooring technician handling your remodeling project. Our specialists have a reputation for providing the personalized customer service and quality workmanship expected by our clients. Let us handle the tough work -- your only job is to enjoy and appreciate the look of your stunning new floors. Our commitment to quality service and workmanship is evident in everything we do. We also take the extra step with the industry-forward “Ultimate Confidence Guarantee.” Select four- and five-star rated floors are backed by these leading warranties. For example, if you find a fault in our installation services, then we will return to your property and correct all errors at no additional cost to you. After all, your satisfaction is our top priority. Contact us today for hardwood flooring that enhances the value and appeal of your property. We proudly serve Allen, Parker, Murphy, Richardson, and Parker, Texas, plus the surrounding areas.